Tall and sleek, the SPAN planter is the perfect addition to any front entrance, deck or patio. Featuring a contemporary powder coated UV protected finish and a modern modular design, the SPAN planter is ideal as a patio accent or as restaurant divider. Crafted from thick gauge, fully seam welded galvanized steel, all Veradek Metallic Series planters are proven to resist weather related cracking and rust - both in winter or summer. 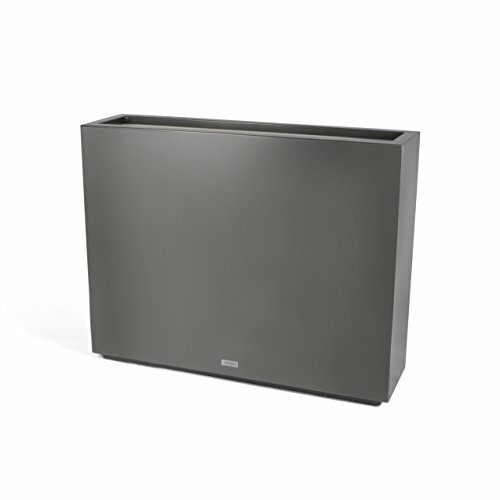 All Metallic Series planters are solid, yet lightweight and are protected by a strong, scratch resistant powder coat, ensuring that they will stand the test of time in both commercial and residential settings. In addition, all Metallic Series planters are equipped with styrofoam insulation to help ensure that plants stay healthy in both hot and cold extremes and a removable shelf to make planting easier. With a Veradek product you can rest assured that you are receiving the perfect balance of design, durability and convenience. If you have any questions about this product by Veradek, contact us by completing and submitting the form below. If you are looking for a specif part number, please include it with your message.